Been doing a 2nd run of this, and I have no idea what to do in this cave. 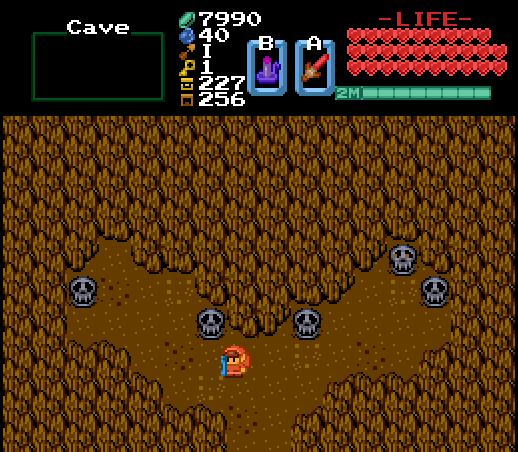 It's the only one left on the overworld marked as an item cave. I've tried every item on that skull statue, I'm pretty sure. That skull statue doesn't do anything I believe. You obtain the item by killing all enemies. Edited by Orithan, 19 September 2018 - 02:25 PM. You most likely obtained the item earlier, the item is just lying on the floor on the left when you enter. An update is on the way. This fixes a bunch of design quirks. Houses are placed a little more randomly. The previous "bias" led to some locations being the start point more often than intended, as well as the other houses being filled with a similar bias. Tier III Shrines are no longer limited where they can appear. This means you now might find one in a spot blocked by Hammer for example. Water should work a lot better with Ladder and Flippers. There are also more locations you can freeze water than before. As a side effect, you no longer use the Ladder on coast screens. One Ladder required coast cave has been changed to reflect this. A couple of Tier IV Shrines now have Ladder 2 usage. The logic has not changed though, Ladder 2 never appeared in those Shrines to begin with. This will help with following Chained Logic though. "Arrow 2" statues have been changed to instead be activated by ANY strong arrow. Iron Arrows no longer qualify, and having Silver / Fire arrows does not make every Arrow-damage weapon qualify either. Increased the display range of some Amulet-hidden objects. Fake walls are now marked by Lens the same way they are in Omega. Cane of Byrna now one-shots a lot of "small" enemies, to further improve its defensive abilities. What's going to be new with the island music?